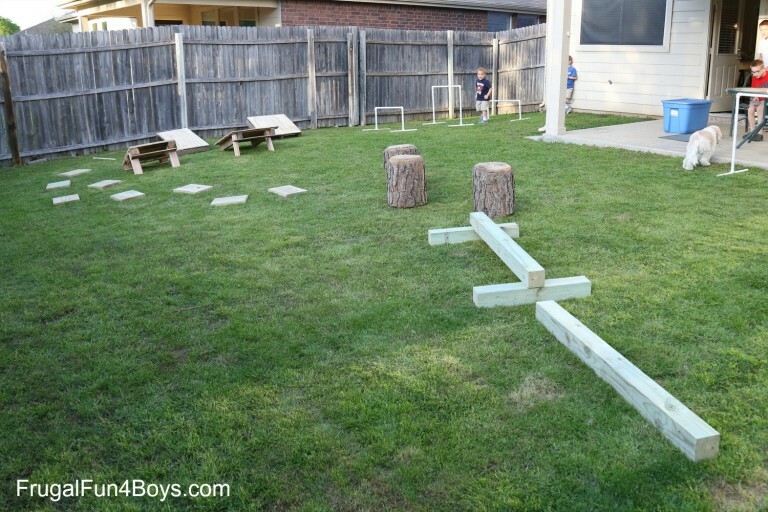 It's a natural and common occurrence to find kids making and building obstacle courses in their backyards. Why not help them out this year and up the game with some planned ideas? I have put together a list of ways to use household items to make an obstacle course. I will give you some game ideas, possible prizes, and safety concerns to watch for on your obstacle course. Do you have a ladder in the garage? It is the perfect addition to an obstacle course. You can lay it down flat so that kids have to walk on top of it. Or you could set the ladder standing straight up so that your children have to climb over it. Make sure that your ladder is not too tall and place the ladder on a stable, flat area in your yard. Always supervise children if they will be climbing over the ladder. During the summertime, pool noodles can be found almost anywhere. Not only will pool noodles make swimming fun, they can also make your obstacle course even more fun than before. Put a yard stake into the ground and slide one side of the pool noodles onto it. Stick another yard stake into the ground across from the first one and bend and slide the other side of the pool noodle into it. Once you have both ends of the pool noodle attached to the yard stake, it should look like a half circle shape. Continue repeating with other pool noodles until you have a line of half circle-shaped pool noodles that form a tunnel. Let children try to crawl underneath the pool noodles without touching or bumping into them. If children are brave, they could try to hop over the pool noodles without bumping them. Buckets can be used in many different ways on an obstacle course. You could have each child jump over or walk on top of the buckets, or you could use the buckets to hold pool noodles up to create a limbo. Chances are that you have some chairs around your house or garage. Try carefully lining up chairs, so that children have to walk over or crawl under the chairs. Do you have a swing set in the backyard? This will make a wonderful addition to your obstacle course. If you don't already have a slide, you could build your own. Have children slide down the slide, or, if they are capable, have children climb up the slide. However, this may be hard for young children, especially if your slide is steep. Tires are probably something you normally would not find around the house, but you could save the tires that you remove from your car due to a flat tire or low tread. Lay out the tires so that kids have to hop through them. You could also stand the tires straight up and have kids try to crawl through them. Sloped Pallet - To make a sloped pallet, take a wood pallet and drill two 2x4s to each end on the same side like legs on a table so that the pallet slopes when it is turned over. Drill a piece of plywood to the pallet so that children’s feet won't fall through the pallet. Make several sloped pallets. Have children try to run over the sloped pallet as fast as possible without slipping. Balance Beams - 4x4 wood will make an excellent balance beam. To test children's balance, drill 2x4s to the bottom of the 4x4. This will lift up the 4x4 to make a raised balance beam. Wood Trunks - Stand the logs upright so that kids have to hop from one log to another. Balloon Table - You will need to use many colorful balloons to make this obstacle course. Use as many balloons as you can. Fill each balloon with air. Tie the balloons with a string, and tie the string of balloons to a table. If built correctly, each child should be able to dive under the table and be completely hidden and have to push under the balloons to get out. If you want, you can tie balloons to other items, such as above slides and on pool noodles. This will make the obstacle course more challenging because each child has to push his way through. Timed Course - This is perhaps the most popular of all obstacle course activities. Time children, yourself, or others to see how long that it takes to complete the course. Alternate Course - Make up alternate courses with your main course. You may want to add some temporary obstacles like going under a table or over a bench. Backward Course - Go through the course from end to start. Another variation is to go through the course the correct way from start to finish but while walking backward. Front and Back Course - Complete the course and then continue on from end to start. Children will be completing the course twice from start to end and then from end to start. Carry a Water Balloon - Try to complete the course while carrying a water balloon without breaking it. To make the balloon more fragile, blow air into the balloon before tying it shut. Relay Races - If you have enough people, put together relay teams. Have one member from each team start the course, complete it, and then tag their next team member to do the same. The first team to have all members complete the course is the winning team. Newspaper Walk - Each child is given three newspapers. From the starting line to the finish line, each child must set a newspaper in front of him so that each step he takes, he is on a newspaper. Because your child will only have three newspapers, he will have to reach back and grab the first newspaper and lay it out in front of him in order for him to continue walking. This game will slow down the time it takes to complete the obstacle course and therefore makes the fun last longer. If you want to make this game even more challenging, you could turn it into a race. The child who gets to the finish line the fastest while still taking every step on a newspaper is the winner. Rope Swing - If you have a tree or sturdy post in your yard, a rope swing can make a great addition to your obstacle course. Place a kiddie pool underneath or slightly in front of the rope swing. The kiddie pool could be filled with balloons or water. 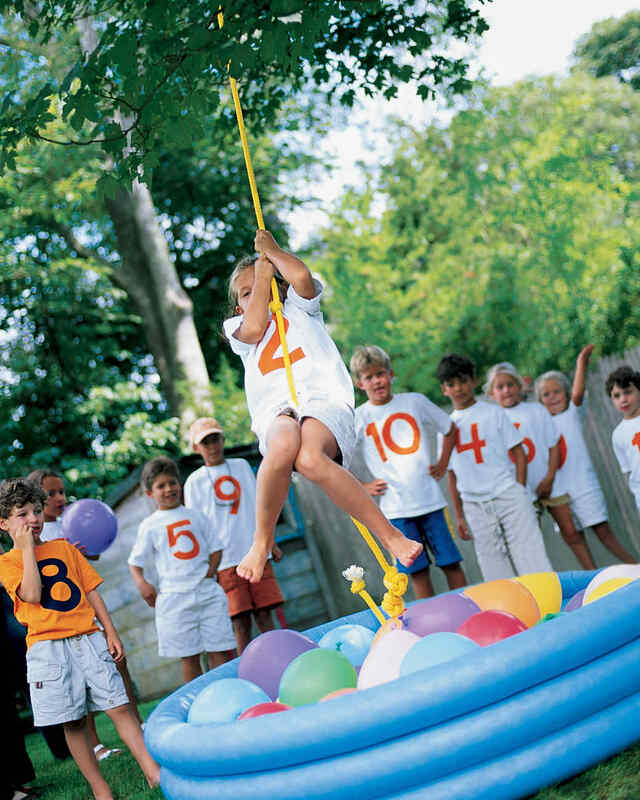 Have each child try to swing with the rope swing over the kiddie pool. If you fill the kiddie pool with water, make sure an adult is there to constantly supervise. This idea is best used on a hot day so that children do not get too cold. Food - Ice cream treats, fruit snacks, chocolate, or anything you want. Food can be a great motivator! Ribbons - 1st, 2nd, and 3rd place ribbons will add a traditional flare to your obstacle course games. School/Art Supplies - Useful and fun prizes are art supplies that kids will need or use for school or summer art projects. Markers, crayons, drawing paper, etc. all make useful prizes. Certificates - Buy some certificates to your local ice cream store or any store with kid-friendly items and to redeem as prizes. Water bottles - There are a wide variety of water bottles available in many shapes, sizes, and colors that you can find at local stores such as Walmart or dollar stores. Not only are water bottles festive and fun looking, they are useful items to have to keep kids hydrated during the hotter months of the year. Pick up downed items after each pass through the obstacle course. For example, if a bucket or chair is knocked over, pick it up before the next person attempts the course. Don't play on the course in inclement weather especially if lightning is in the area and you have any water obstacles. Wind can also be hazardous because obstacles can blow over and hurt someone. Make sure you build the backyard obstacle course securely and firmly. If anything is built improperly, fix it before children use it. It may be a good idea to try doing the entire obstacle course yourself before kids use it. That way, you will notice any loose or broken materials that could lead to injury. Obstacle course backyard fun is timeless. It truly does not go out of style. I have shared some ideas to help you and your children make an obstacle course this summer out of household items. I have also shared several game ideas to play on your obstacle course, as well as prize ideas for rewards. 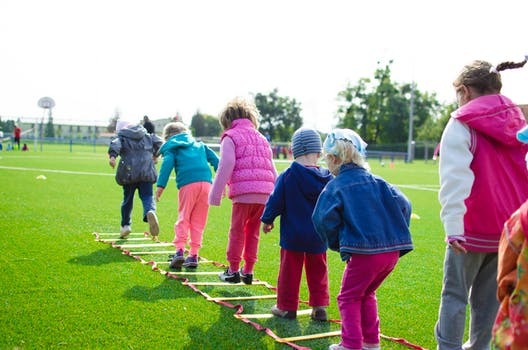 Use safety precautions and constantly supervise children while using your obstacle course. Have fun and be creative! 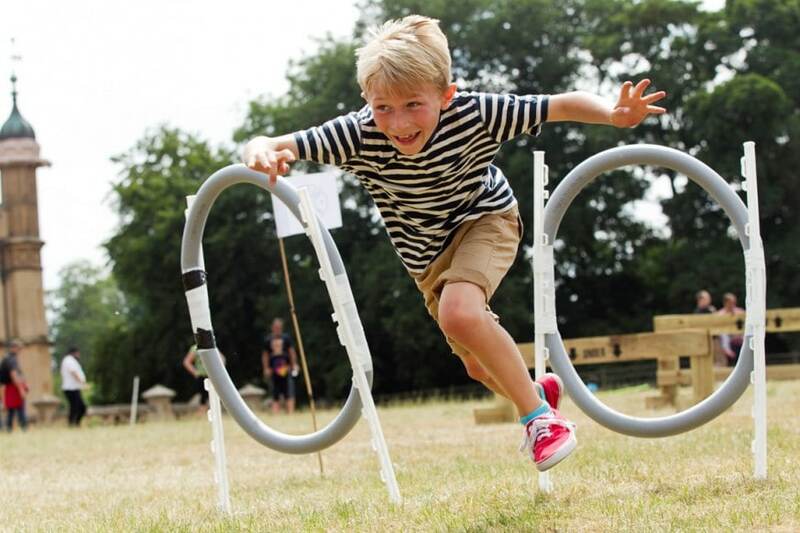 Don't forget to take pictures of kids and adults using the obstacle course to create fun memories to last a lifetime.